Wolf Hall series reviewed: A rich, riveting TV adaptation brings Hilary Mantel’s book to life. A rich, riveting TV adaptation brings Hilary Mantel’s book to life. 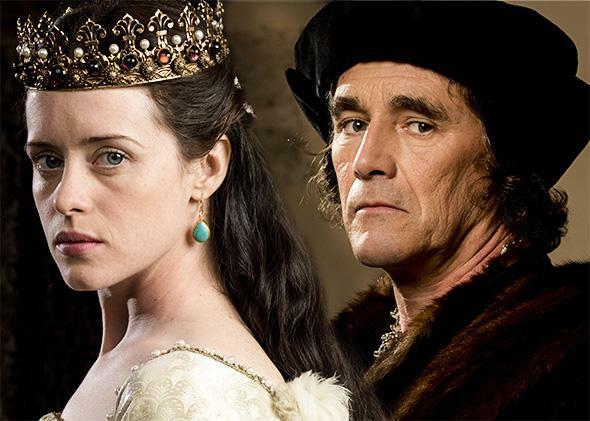 Claire Foy as Anne Boleyn and Mark Rylance as Thomas Cromwell in Wolf Hall. Photo illustration by Slate. Photos courtesy of Giles Keyte/Playground & Company for PBS. “As some men have an eye for horseflesh or cattle to be fattened,” Hilary Mantel writes in Wolf Hall about Thomas Cromwell, “he has an eye for risk.” The ambitious six-part Masterpiece production of Wolf Hall—adapted by Peter Straughan from Mantel’s two Booker-winning novels, Wolf Hall and Bring Up the Bodies—is an exploration of that eye for risk. But it ends, tantalizingly, just before the real-life Cromwell’s wagers began to be called in, dooming him. Directed by Peter Kosminsky and originally telecast on BBC Two—the first episode premieres in the U.S. on Sunday night—the series is a robust and satisfying experience, one that doesn’t skimp on the story’s world-spanning political and religious intrigue, but keeps at its center one man whose calm gaze focuses the sweeping material and makes it feel manageable. watching the faces of other people, to see when they register doubt, reservation, rebellion—to catch that fractional moment before they settle into the suave lineaments of the courtier, the facilitator, the yes-man. As Cromwell, Rylance is aggressively blank, convincingly intimidating as a man who intimates, in Mantel’s writing, that he might once have torn out a man’s heart—but convincingly mournful as a man who lives through tragedy and still pursues his goals because, he says, “God takes out your heart of flesh, and gives you a heart of stone.” The series underplays those tragedies somewhat—the deaths that tug at Cromwell throughout Mantel’s books earn only occasional mentions onscreen—but Rylance’s impossibly large eyes and deeply lined face do a lot of emotional work on their own. How can I explain this to you? The world is not run from where you think it is. From border fortresses, even from Whitehall. The world is run from Antwerp, from Florence, from Lisbon, wherever the merchant ships set sail off into the west. Not from castle walls—from counting houses, from the pens that scrape out your promissory notes. In Mantel’s vision, which is expertly dramatized by Straughan, Kosminsky, and Rylance, Cromwell’s ability to manage risk, to see the future, makes him a kind of prophet of his time. He and only he understands that soon the world will no longer belong exclusively to the highborn, that soon bankers and lawyers and commerce will rule the lives of men both noble and common. And so a man like Cromwell—the son of “a scrapper and a brawler” who “can draft a contract, train a falcon, draw a map, stop a street fight, furnish a house and fix a jury”—is newly valuable. Wolf Hall is an ode from a ferociously productive novelist to those who, like Cromwell, work “all hours, first up and last to bed.” He’s a jerk-off. He never takes work off. Rylance lurks in the shadows of Wolf Hall—Kosminsky reportedly shot most of the series by candlelight—and his more recessive choices play nicely off the brighter performances of his co-stars, especially Anton Lesser as a bedraggled Thomas More; Claire Foy as a dogged, tireless Anne Boleyn; and Bernard Hill as her uncle the Duke of Norfolk, who gets all the loudest lines. “I will tear him with my teeth!” Norfolk screams at Cromwell, who coolly inquires, “My Lord, may I substitute the word bite?” Homeland’s Damian Lewis is less assured as Henry VIII, who ought to appear to us, as he does to England, larger than life and instead seems like an enthusiastic boy playing at being king. He imagines himself entering Anne, not as a lover but as a lawyer, and rolled in his fist his papers, his writs; he imagines himself entering the heart of the queen. In its chambers he hears the click of his own boot heels. Then, in the show, he caresses her neck, her little neck. Wolf Hall ends—spoiler from 1536!—with Anne’s beheading, which Cromwell witnesses along with his son, Gregory. The rush to judgment is as unsatisfying in Wolf Hall as it likely was in real life, and if the final episode of this rich and wondrous series is not quite as pleasurable as the five that preceded it, that’s to be expected when the historical events it portrays are so dire, and its hero so miserable about them. But as Anne kneels, blindfold around her eyes, the executioner slipping his feet from their shoes so as to mislead her about the direction of the stroke, Cromwell urgently grips his grown son’s arm. It’s a fitting end to a series that strives, like the extraordinary books from which it is adapted, to slip inside the 16th-century mind, to understand the human moments in the sweep of history.